The C. Ruxton and Audrey B. Love Collection, Christie's, New York, 20 October 2004, lot 569. This robustly carved clock frame of exceptional scale is inspired by the engravings of Jean-Charles Delafosse (1734 - 1789) disseminated from the late 1760s. Delafosse's ornamental designs for trophies, cartouches, clocks, decorative objects and architectural details were first published as part of his Nouvelle Iconologie Historique in 1768 and reedited in expanded versions in the 1770s. The plates were composed to inspire artisans working in a wide range of media, who could either carry out the published design or re-use various elements from it. The use of a military trophy points directly to Delafosse as the source of the design for this clock as fanciful compositions employing this type of iconography are plentiful in his work. 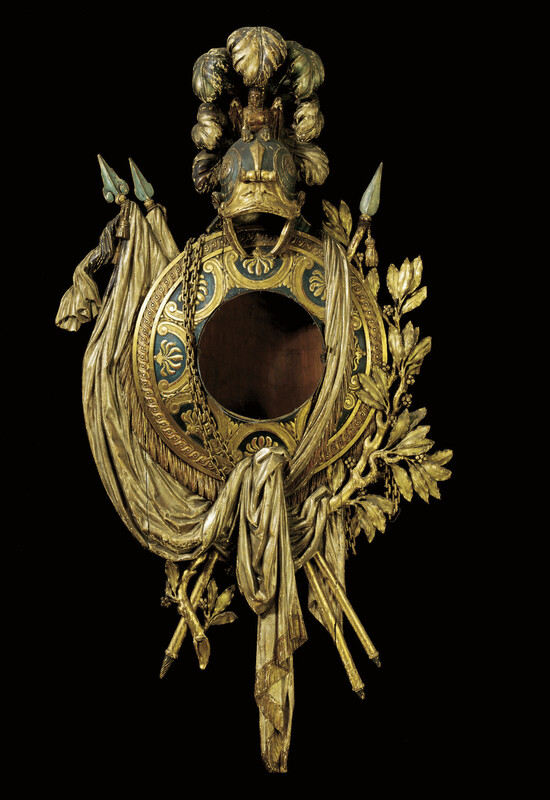 Two designs for cartel clocks employing distinct motifs found on the present lot - one surmounted by a feathered military helmet and a figure, another with crossed drapery-swagged spears - are published in L'oeuvre de Delafosse. Cahiers de bronzes, vases orfèvrerie, etc., Paris, n.d., c. 58 - 59.